It is probably because I know the Darracq car so well that I like it. I have owned and driven the 6½, 9, 12, and 24 h.p. cars, and having had several years’ experience of these (and other) cars, I shall endeavour to put some of the good points of them forward and also, perhaps, for the benefit of my readers, I might put some of the bad ones. They exist in every car, but it is hard to find people who will put them in print for fear of getting themselves into hot water with the makers. My experience of various cars leads me to think that, taking into consideration the price of the Darracq, there are few cars on the market which give one a better value for one‘s money. The chief point of merit is the safety with which one can drive these vehicles on a slippery surface. It was not so very long ago that I experiencel my first sideslip on a Darracq, after several years of driving them in all weathers; and I can honestly say that I have never slipped more than a few feet, whereas on other cars I have had numerous very bad sideslips, and on several occasions the machine turned completely round. The reason of the Darracq‘s steadiness is,I believe, the long wheel base and the situation of the engine. The centre of gravity seems to me to be more in the centre of the car than in any other makes. The machinery is of very simple construction and is very easily got at. The nuts are so placed that one can undo almost any of them with an ordinary spanner without it being necessary to use a tubular spanner. This applies more especially to the latest patterns, and not to the older models. Nearly every car is fitted with an inspection hole on the side of the base chamber, so that one can at any time ascertain the amount of oil in the crank chamber, and also see that the crank head dips into it. The Darracq has several other advantages, such, for example, as allowing an inspection of the wear in the crank brasses, facility for putting oil in the crank chamber should the pump get out of order, or of baling out any excess of oil. When running out any excess of oil by means of a tap fitted to the bottom of the crank chamber, it is a matter of guesswork, whereas by the Darracq method the exact amount can be seen at a glance, which prevents any mistakes being made. This plxn should, I think, be adopted on every car, as the most important thing to guard against in any motor is the insufficiency of oil in the crank chamber. As a hill-climber the Darracq is world-famed, and it may not be out of place here to remark that I have a favourite hill near the Crystal Palace up which have tried several well-known cars. The majority have not beaten my old 6½ h.p. 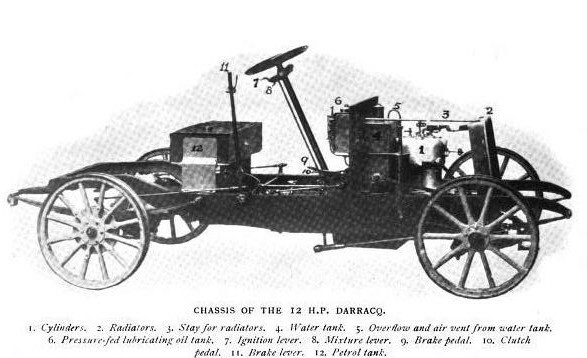 Darracq, although many have been three or four times the price and had much larger engines. Several improvements have been made on the latest 24 h.p. car, especially in the lubrication. The oil is forced into the crank chamber by means of the circulating water on which it floats, and consequently the hotter the water becomes (possibly from want of lubrication) the more the oil is forced into the crank chamber. 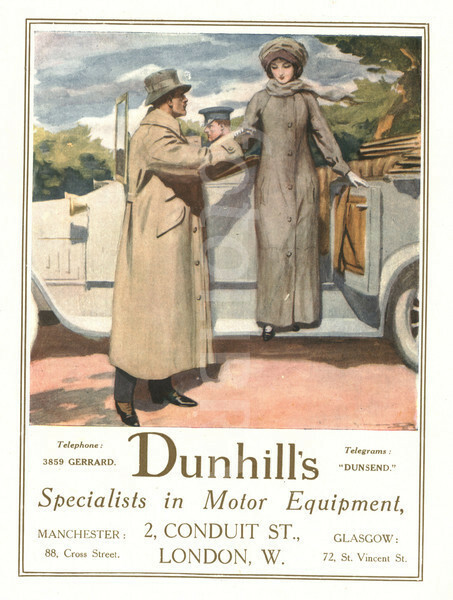 An important feature of the Darracq cars, and one in which they are unlike most of the heavier type of car, is the position of the change-speed handle. This is placed directly under the steering wheel, and to my mind this is the best place possible for the change – speed lever. There is no bending down and forward; it is out of the way, and is very handy. Formerly the driver was able to mount and dismount on the right-hand side, and not disturb the person sitting on his left; but I am sorry to say that this is a thing of the past, as now they have put the brake handle across the entrance, following the example, I suppose, of other makers. The batteries on the 12 h.p. are placed under the bonnet on the left-hand side, which entails having only very short primary wires. The only fault against this arrangement is that the boxes, as fitted, are made to take dry batteries, and when they run out, either new dry batteries must be bought or a new box made to take accumulators, which, as a rule, are not the same shape. From Part I. of Cars and How to Drive Them, I extract the following in reference to the Mercédes radiator, which I thoroughly endorse. “I am afraid there will be some disastrous results when the French makers copy the Mercédes cooler.” This is what happened in my 24 h.p. Darracq. The tank does not hold a sufficient amount of water, and, unless the car is travelling fast, the water boils over. I have found that if the spark is slightly advanced and the exhaust valves lengthened it helps to cure it, but I do not like this mode of water cooling. The fan, I find also, draws in the fine dust (especially in the hot weather) on to the very place where it should be kept away from at all costs, namely, the valves and the working parts of the engine. The pump for circulating the water is not quite satisfactory, being too small. The brass flanges which open by a spring placed between them on the centrifugal system perform the duties of a pump, but this, I think, is not so good as the Panhard arrangement. The small flange and spring of the Darracq pump can, however, be changed in less than three minutes, which is very handy, and, like everything fitted to the Darracq, they are very easy to get at. The brass tanks are very nicely made, and I wish other makers would take a “tip” from them. The edges of the tanks are rolled, then soldered, and not riveted. The latter, I find, usually work open after a few months’ use and cause endless trouble. The foot brake consists of two small brass flanges, which press on either side of the drum brake. In all the other sizes and patterns of the Darracq cars the brakes are very efficient, but in the latest 24. h.p. and 12 h.p. they seem to be fitted too close to the gear-box, and consequently, unless an iron plate is fitted between the two, the brake drum is liable to get covered in grease. Sometimes this, too, happens with the back wheels, particularly if the advice, as given in Darracq’s notes on the car, is followed, i.e., “to put oil in the differential box.” I always put plenty of grease, especially as the bearings on the outside of the axle have separate oil holes, and do not require any lubricant to run through the live axle from the differential box for their oiling. At the beginning of Edward VII’s nine year reign, the motorcar was simply a status symbol that only the very rich could afford to purchase and maintain. The horse, generally cheaper and familiar to the population, continued to dominate everyday travel and transportation, but by 1910, equine transport had become almost obsolete. The manufacture of motorcars originated in France and Germany in the 1880s, where Continental inventors experimented with the internal combustion engine. Engineers such as Edmund Benz, Gottlieb Daimler, Nikolaus Otto, Wilhelm Maybach, and Alphonse Beau de Rochas developed and patented a variety of engines during the 1860s through 1880s, but the promise of the motorcar did not bear fruition until the mid-1880s, when Edmund Benz designed a “four-stroke engine that was used in his automobiles, which were developed in 1885, patented in 1886, and became the first automobiles in production.” Gottlieb Daimler, a German engineer, patented his own version in 1885, and further production of engines for self-propelled vehicles continued into the early-1890s. 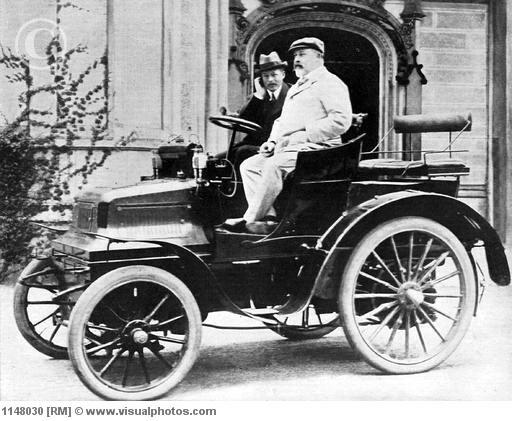 The modern automobile was built in France by Panhard et Levassor in 1890. This model had its engine in the front under a bonnet (hood), a chassis (body) much like the chassis of today, a sliding gear transmission, clutch and pedal breaks and a foot accelerator. 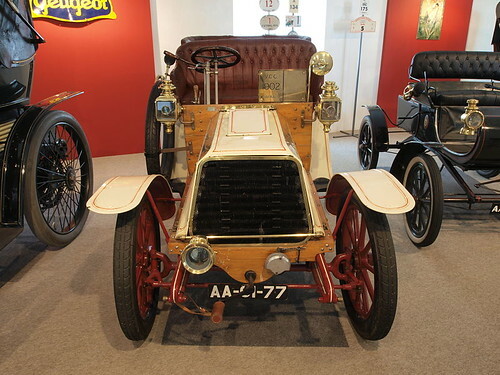 Panhard had serious competition from Peugeot, also French, and a growing number of European and American manufacturers during the first half of the 1890s. Meanwhile, Britain’s development of comparable technology was paralyzed by the Red Flag Act of 1865. Its crippling clause–“Any vehicle on the public highway, other than a horse-drawn vehicle, must be preceded by a man carrying a red flag in day and a red lantern at night, to warn oncoming traffic of the vehicle behind him.”–had been placed into affect by the railroads, who wished to halt the rising popularity of the steam-cars in the 1850s. Because of the presence of the flag-carrying man, the speed limit was restricted to four to five miles per hour, a crawling pace that was bound to discourage any sporting gentleman. In 1895, the Honorable Evelyn Ellis brought his French-made 4 hp Panhard machine to England in defiance of the act, and when it was repealed in 1896 and the speed limit increased to fourteen miles per hour, new motor enthusiasts commemorated the repeal of the hated Red Flag Act with a London to Brighton run on November 14th of that year. While the original English motorists were typically wealthy sportsman, it wasn’t until Edward VII took up motoring (with relish) that the motorcar began to gain precedence over the horse and carriage with the Marlborough House Set. The King owned several automobiles, all painted in his own royal claret color, which he took for speedy drives up and down country roads. He was an impatient and excited driver, loudly encouraging his chauffeur to pass everything and everyone on the road, regardless of their speed, size and status. It was a very frequent occurrence for a waggon lumbering down a road to Sandringham to be upset due to the careless speed of the King of England. However, he always politely proclaimed oncoming traffic of his imminent arrival with the honk of his four-key hornet horn, which the superintendent of the royal cars, who sat in front, had to play as the king’s car zoomed along. Surprisingly, he refused to allow his wife, Queen Alexandra, to own a motor of her own. 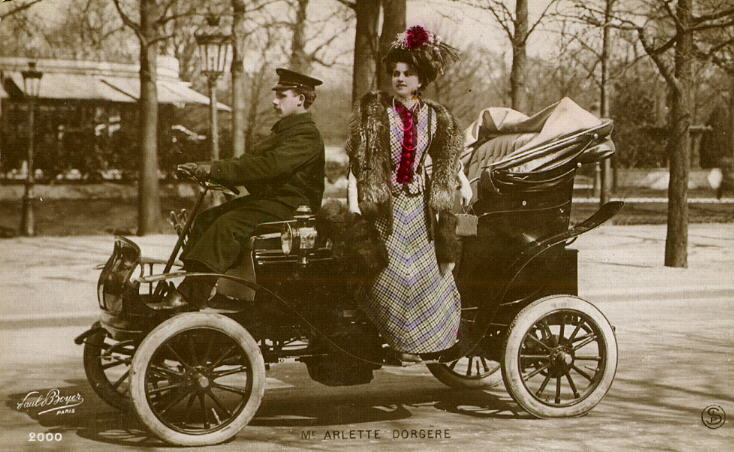 It was only after Alexandra borrowed motors from friends, much to the anxiety of the Court, that Edward was eventually persuaded to allow her an automobile of her own. Alexandra was the original backseat driver, growing notorious for prodding her driver violently in the back with her parasol, shouting directions and “helpful” orders whenever a dog, or child, or anything else crossed their way. Due to the absence of hoods or windscreens, motoring called for special clothing. Fabrics such as tweed and cloth were out, for the wind whipped them out into balloons. Loose topcoats in leather, or special motoring coats from Burberry or Aquascutum acted as protection from weather and cold, with the stipulation that the coats should button closely around the wrist. For women, long fur-lined leather or cloth coats for winter and long linen or alpaca dust coats for summer were preferred. Oil smuts could be a problem so women wore flat hats tied on with large, thick veils. For men, double-breasted reefer jackets, buttoned high with small turn down collars, wind cuffs with straps, trousers bound tightly around the ankles, and yachting cap and gloves. For the winter, leather coats, helmets and fur-lined coats and twill holland or silk dust coats were recommended. During a bout of rain, experts advised the adoption of a garment shaped like a bell tent, from which the rain would run. Goggles were also a must. Socially, the motorcar increased the amount of time spent on leisure activities. No longer were weekend parties hasty, hectic affairs as the motorcar allowed parties to speed from London to the countryside for what hostesses fondly called “Saturday-to-Mondays”. Affairs were carried about more easily, as a wife or husband was now able to drive to a quick rendezvous with a lover in an inn or tavern and back before their unsuspecting spouse could comment upon their absence. General travel was made easier not only by the motorcar, but also by the increased network of tramways that made the countryside more available to Londoners, while railroads, ever vigilant, ran seaside excursions. Enthusiastic motorists added another form of leisure to the motorcar in the guise of touring. Countless books were published between the years 1896 and 1914, recounting motor tours in both remote and accessible places like the Hebrides and France, as well as in places uncharted by the motorcar, such as Tunisia, China or Siberia. This new form of holidaying was incorporated into the itineraries of trusted travel agents such as Thomas Cook & Son among others, who provided maps of possible touring routes as well as the locations of petrol stations. Soon, the 1900s became the era of speed. The first motorcar race was held in 1894, and was quickly followed by the establishment of Grand Prix from Le Mans, France to Daytona Beach, Florida, where, in 1904, Willie K. Vanderbilt, Jr. clocked up to 92 mph in his 90 hp Mercedes. The Peking-Paris race of 1907 was won by the journalist Barzini, the Prince Borghese, and the mechanic Ettore Guizzardi, who drove an Italian model called the Itala. Despite the success of British drivers in the early races, the sport was impossible on the British Isles since racing on public roads was illegal. This caused British drivers to race on the Continent or in Ireland (i.e. the Gordon Bennett race of 1903). Hugh Locke-King, a wealthy landowner, was aided by a group of wealthy friends to propose the construction of a racing course. The result was Brooklands track, a huge oval circuit with banked corners. Work was completed in 1907, and the world had its first purpose built race-track. Other nations would soon follow suit. The motorcar also introduced a new lexicon of terminology into the English language. One kept one’s car not in a garage, which was French and therefore rather naughty, but in a motor stable. A driver was not yet called a chauffeur, but a mechanic, for he often doubled as an actual mechanic as most motoring gentlemen found it beneath them to tinker beneath the bonnet. It also altered the patterns of servants and functions of the home, which had remained unchanged for centuries. Stablehands and coachmen were either pensioned off or taught to drive, while mews were either converted into motor stables or into small, attractive residences, and horses were sold and carriages dismantled. As with everything, there was a dark side to the motorcar. A dark, expensive side. Early motoring demanded both time and money–Money because motoring was an expensive occupation, while time was needed for running repairs, not only for a succession of tyre punctures, but for the continual mechanical faults of varying severity. A motorist who drove on a daily basis could spend at least an hour a day cleaning, oiling and adjusting. Tyres cost ₤25. 15s a pair and were always bursting. Because there were few instruments to maintain the car, the first sign of the engine overheating was the smell of burning paint. Pistons were easily ruined and some more powerful cars guzzled as much oil as petrol. While the price of petrol varied enormously from a copper or two to 1s.3d a gallon (depending on the greed of the garage proprietor), filling stations were few and far between, causing drivers to depend on a steady supply on hand, especially as there were few others on the road to assist a stranded motorist. Until 1903, there had been no numbers or licenses. From henceforth every car was required to carry a registration number. By the end of the year, 8,500 motors were licensed in Britain (the registration number A1 allocated to Earl Russell), which proved that the motorcar in Britain was no passing craze of the idle rich. At the beginning of Edward’s reign, London transportation was exactly as Dickens knew it; that is, the horse provided the locomotion as it had for centuries. However, motorbuses were first licensed by the police authorities in 1904, and by 1910, they had displaced 22,000 horses and 2,200 horse omnibuses. A few displaced drivers continued their trade, becoming known as “pirates” because of their cut-rate prices, and continued to run as late as 1916. Motorcabs, informally known as “taxis” were introduced to London in 1907 after the General Motor-cab Company placed one hundred vehicles on the road. By the end of 1907 there were 723 taxis in London, a figure that quadrupled the in the next year. By 1910, there were 4,941 taxis, though there remained on the streets, 1,200 hansom cabs (affectionately called “gondolas of the street” by Disraeli) and 2,500 horse-drawn four-wheelers. The motorcar revolution was seen as similar to the railway revolution. Nevertheless, there was one main difference: the railway had been an instrument of democracy, while the car represented the private ostentation at its most arrogant, the final triumph of the haves over the have-nots. 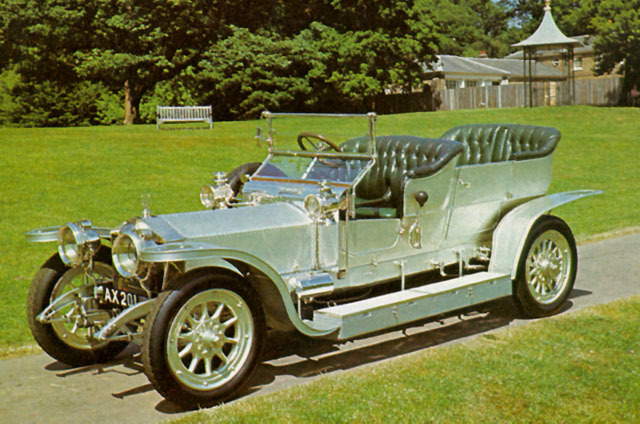 The ultimate in Edwardian status symbol was the 1911 Rolls Royce “Silver Ghost”, which cost ₤1,154, more than what most people earned in ten years. Four words sum up transportation in Edwardian England: Tube, train, tram, and car (which, incidentally, is the title of a 1903 book on the subject). Of the four, the tube was the most thrilling and least controversial advancement in technology. The Tube, or London Underground, had its roots in the 1840s, when it became the “world’s oldest subway tunnel.” Five decades later saw the opening of the City and South London, and Waterloo and City Railways, in 1890 and 1898 respectively. Oddly enough, the public was rather apathetic to this new mode of transportation, but the tide changed dramatically when in 1900, the Prince of Wales inaugurated the Central London Railway, which ran practically the entire length of London and charged only twopence between any two stations. Quickly dubbed “The Twopenny Tube” by the Daily Mail, the railway had stations at Shepherd’s Bush, Holland Park, Notting Hill Gate, Queen’s Road, Lancaster Gate, Marble Arch, Bond Street, Oxford Circus, Tottenham Court Road, British Museum, Chancery Lane, Post Office, and Bank. By the end of 1900, the railway had carried 14,916,922 passengers. Central London Tube, still frequently called the ” Twopenny Tube,” though the universal 2d. fare charged from the opening of the line in 1900 was abolished in 1907. About 6 miles. From Wood Lane, beyond Shepherd’s Bush, to the Bank. Piccadilly Tube (Great Northern, Piccadilly and Brompton Railway). 9⅓ miles. Finsbury Park to Hammersmith, with spur line between Holborn and the Strand. Bakerloo Tube (Baker Street and Waterloo Railway). 5 miles. From Elephant and Castle to Baker Street and Edgware Road. Hampstead Tube (Charing Cross, Euston and Hampstead Railway). About 8 miles. Charing Cross to Euston and Camden Town; here the line forks, one branch proceeding to Hampstead and Golder’s Green, the other to Highgate. City and South London Tube. 7½ miles. From Clapham Common to the Bank, Moorgate, the Angel, and Euston. Great Northern and City Tube. 3½ miles. From Moorgate to Finsbury Park. Waterloo Tube (Waterloo and City Railway). 1½ miles. From the South-Western terminus at Waterloo to the Bank. Metropolitan Railway, or “Underground.” From Aldgate to Hammersmith and South Kensington and from Baker Street to Harrow and beyond. Forms with the District Railway the “Inner Circle”. If study of the map demonstrates the underground’s sphere of usefulness, you have but to travel over its circles and extensions at certain hours and seasons to realize to what extent London’s millions have come to rely upon it. Should you chance to be abroad early enough, the working-man will crowd you out of third class carriages, half empty during the day; a few hours later and the city man. in his turn, will leave you no space in the first, entirely deserted once the period of his migration is temporarily at an end. Again at corresponding hours in the afternoon your right to first or third class seats will be as closely contested. Or you need but to come home at night with the multitude from Earl’s Court or Olympia, or set out for Hammersmith on the day of the Oxford and Cambridge boat race, to understand why dividends are regulated according to popular amusements. In picturesqueness the underground makes rich atonement for vile atmosphere, for nervous wear and tear, and much else. It is in this respect that it leaves the elevated, cleaner and purer though the New York line may be, so far behind, and that it makes the electric road seem so ugly and prosaic. You receive no hint of its curious effectiveness from the entrance on the street ; that is, as a rule. A few stations have their qualities above ground as below; Charing Cross, for example, as I see it from my window, its walls flaming with many posters, on one side shut in by the lines of Hungerford bridge, on the other by the soft green of the shrubbery in the gardens and the branches of overshadowing trees. But Charing Cross is one of the exceptions. The ticket office, or booking office, to be English, is uncompromisingly ugly. In appearance it would have fared better had it been left on the low level of the platform as was originally intended. For once on the platform the grime and dirt and unsightly detail are lost in the beautiful play of light and shadow. Rembrandt would have exulted in the rich darkness of the nearest distance ; in the way the daylight filters in through the glass roof or skylight above and mingles with the glare of gas and the red and green glow of signals ; in the bits of color that tell so well in the sombre surroundings—here the posters on the walls, here the books on the stalls, and there it may be the gay gown and flaunting feather of a lingering passenger ; and, above all, in the wonderful effects of the trailing outspreading smoke, as the train comes thundering in. 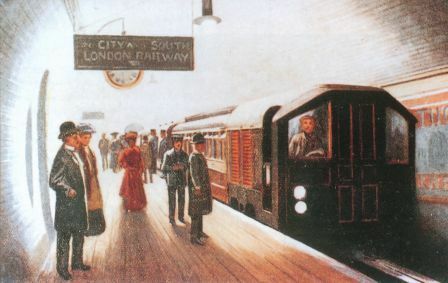 There are stations where the track makes a great curve just before it reaches the platform, and engine and smoke cloud round it with a fine rythmical swing ;there are others where the low roof is supported by long lines of columns, and the smoke loses itself among them as in the dim aisles of a cryptlike basilica ; and there is not one without its distinctive features, its special picturesqueness. The marvel is that the artist has but just discovered the underground. By this time, there was no outcry against women riding the tube as there had been when the omnibus made its initial appearance on London’s streets, and advertisements made pains to show well-dressed ladies taking the Tube from the West End to various genteel amusements. Plus, as stated above by Mrs. Pennell, the Tube was a rather democratic method of travel, and its popularity also played a role in the increase of suburbs, since a bank clerk in the City or a policeman were not forced to live in London to get to work on time!